Clean and fully functioning! Includes: TR4M6GNC Power cord eSATA cable Quick Installation Guide I have other TowerRAID drive enclosures for sale. Additional shipping costs apply. To expedite and lower the cost of shipping for you, this will ship inside a medium USPS Priority box with tracking without the original box. The power cord, eSATA cable and installation guide will be inside the unit. Actual Power cord, eSATA cable and Quick Installation Guide may vary, but will be included regardless. Sans Digital 8-Bay Hard Drive Enclosure with caddies & power cord NO HDDs or data cables. Great condition, comes with all of its original components. The TowerRAID TR4M6GNC is a new 6G port multiplier solution for complete 6G solution. New generation of 6G TR4M6GNC provides nearly double the performance compare to older 3G generation. This compact JBOD tower utilizing the latest SATA 6G port multiplier technology, where one single eSATA cable connects to four SATA hard drives. These MS2C1 Drive Enclosures have been fully tested and perform to new factory specifications. Model MS2C1. RAID Level 0, JBOD. Form Factor 2-Bay Enclosure. Cooling Fan 40mm Ball Bearing. Drive Interface 2 x 3.5” SATA I/ SATA II. The EliteRAID ER104UT B is a 4-bay hardware RAID 5 rackmount storage unit that utilizes high performance USB 3.0 and eSATA interfaces to provide over 200MB/s in performance. The included USB 3.0 is backwards compatible with the widely available USB 2.0 port, which is a convenient feature when both USB 3.0 and eSATA connections are unavailable. The TowerRAID TR4U is an 4-bay storage enclosure for high capacity storage needs. With a built-in ventilating protective screen front panel, both units utilize a cable-less backplane-design to support up to four hard drives. ESATA Cable. 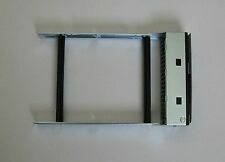 - 2-Port eSATA PCIe Adapter. USB Cable. Opened box. Got it all set up. Worked Fine. - Power Cable. Model MR5CT1. Form Factor 5-Bay Enclosure. Cooling Fan 60mm Ball Bearing. Drive Interface SATA I / SATA II. Safety Regulations CE, FCC, UL. Host Interface & Transfer Rate USB 2.0, Firewire 800 and eSATA. Used, in great working condition. I used this to test multiple hard drives I added to my NAS. This hard drive module allows you to connect multiple HDDs to a system. Note: Pictures show how hard drives can be connected to rack with special screws.Hard drives are NOT included. The EliteRAID ER104I is the latest hardware RAID storage to EliteRAID iSCSI solution. Beside RAID5, Mirroring (RAID 1) and Striping (RAID 0), ER104I supports RAID 6 to protect against up to 2 hard drives defect. Item model number: EN316L BXE. External I/O USB x 2. Give us a shot and we will make sure that you will look to us again! Drive SATA 3Gb/s. Expansion port 3.5" Drive Bays 16. A-Z Computing is a Printer and Printer Parts Manufacturer. Featuring USB 3.0, eSATA and Firewire 800 (1394b) interfaces, MS1CT is an ideal solution for video and music editing as well as graphic design professionals. The combination of fanless design and aluminum housing provide quiet and low-temperature operation. USB 3.0 RAID tower for 8x SATA 3.5" hard disks. Excellent condition, no problems. I've used this tower for about 6 months. BOUGHT NEW AND CANNOT USE. The mini-SAS ports combine four hard drives connections into one, reducing possible points of failures, while preserving uninterrupted data transfer. The TR4X12G also supports SATA drives, allowing users the option to choose between high performance and high capacity storage solutions. Build-in two of the 2.5" hard drive trays and RAID status LED, the unit is selectable from RAID 1 (mirroring) to RAID 0 (striping) with the selectable switch. Model IR12TB. RAID Level RAID 0 (stripping), RAID 1 (mirroring). Model TS1UT B. TS1UT B (1). eSATA Cable (1). Form Factor Single bay Enclosure. USB Cable (1). Supports the latest 6TB hard drive. Drive Interface 3.5” SATA. Easy access LED indicators located on the top. The TowerRAID TR4M BNC is a compact JBOD tower utilizing the latest SATA II port multiplier technology, where one single eSATA cable connects to four SATA hard drives. Four hard drives can be access to the computer individually, providing instant storage expansion with ease. Sans Digital ES104T - 1U 4 Bay SATA (x4) Storage Hard Drive Bay with 4 western digital 250GB hard drives. Unit has been tested and is in good working order. The rack mount face is loose. Comes with power cable. The mini-SAS HD (SFF-8644) ports combine eight hard drives connections into two connections, reducing possible points of failures, while preserving uninterrupted data transfer. The TR8X12G also supports 6G SATA drives, allowing users the option to choose between high performance and high capacity storage solutions. 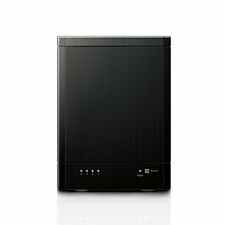 TheTowerSTOR TS21UB Series is a unique external 2.5” SSD/SATA Hard Drive server storage with build-in 1394b (Firewire 800) and USB 3.0. The combination of fanless design and aluminum housing provide quiet yet cool operation. TS1CT - 3.5” USB / eSATA / FIREWIRE 800 / FIREWIRE 400. TS1UT - 3.5” USB / eSATA. Open box never used. This is a Sans Digital Towerraid TR4U-B RAID 4-bay USB Drive - In original box. - In very good condition. TheTowerSTOR TS22UT6G is a unique external 2.5” SSD/SATA Hard Drive server storage with build-in USB 3.0 and eSATA connection. It is a 2-bay storage tower with RAID capabilities that features three different RAID modes, including RAID 0, RAID 1 and JBOD (individual drive access). The newly added LCD display provides RAID, IP and system information. Utilizing the latest SATA II technology, the MN2LP supports hot-swap with RAID 1 (mirroring) and RAID 0 (stripping), allowing the protection against hard drive failures or storage space expansion. 2 RAID enclosures for one low price! All trays included - 2 per enclosure. One unit pictured but the other is identical. Used but in excellent working order, pics are of actual item. The TowerSTOR TS21UT B Series is a unique external 2.5” SSD/SATA Hard Drive server storage with build-in USB 3.0 and eSATA connection. The combination of fanless design and aluminum housing provide quiet yet cool operation. EliteSTOR ES104T - 1U 4 Bay Rackmount SATA to eSATA (x4) JBOD Storage . Shipped with UPS Ground. Brand New and Sealed. Sans Digital TOWERRAID series TR8M B in black - 8 bay SATA to eSATA RAID enclosure NOTE: This item will ship without an exterior shipping box, so delivery signature will be required. Condition is Used. NO drives included. Enclosure only. The TowerSTOR TS1UT B Series is a unique external 3.5” SATA Hard Drive enclosure with build-in USB 3.0 and eSATA connection. The combination of fanless design and aluminum housing provide quiet yet cool operation. Sans Digital HDDRACK5 5-Bay IDE/SATA Hard Drive Organizing Rack. Condition is New. Shipped with USPS Priority Mail. Along with built-in RAID 5 and RAID 6, the MN4LA B provides enterprise-class features that is normally not included in this product price range. iSCSI Support for Vmware. Plug and play to add a bunch of storage to your existing system. Can use this to create software array for RAID storage. 4 HDDs are WD Black Enterprise class. 16 TB of total storage included. 8 x 2TB 3.5" SATA HDDs.